The purpose of this page is to provide short answers to the most commonly asked questions about the project. Other pages of this website discuss many of these topics in more detail. Please consider exploring the website or sending us your question if you seek more information on a topic. I-84 through Hartford is largely built on bridges. These bridges were built in the 1960s to last about 50 years. At this point, they require frequent, expensive repairs to keep them safe. Between 2005 and 2012, the Connecticut Department of Transportation (CTDOT) spent approximately $60 million to repair these bridges. Another $80 million for repairs is needed between 2013 and the beginning of construction on the replacement highway. Repairs are increasingly costly, and the condition of the bridges will continue to worsen over time. The bridges must be replaced or undergo extensive rehabilitation, rather than be repaired. While fixing the bridges on I-84 is the main reason for this project, other project needs include improving safety and operations in the I-84 corridor, as well as increasing mobility for all travelers. Why was I-84 built through Hartford? Long before there was an interstate system, various alternatives for an East-West Expressway were considered to service growing post-World War II traffic into Hartford. Interestingly, while there is a lot of traffic passing through the city, most traffic during peak travel hours begins or ends in Hartford, or points very close by. Why is the project so complex? When it is built, the I-84 Hartford Project will be the most expensive public works project in Connecticut to date. This heavily travelled highway must largely be reconstructed on its existing alignment in a tightly confined corridor, which adds challenges to both design and construction. In addition to improving the highway, the project offers many opportunities to benefit Hartford, undoing some of the damage caused when the highway was built in the 1960s. Improving how the highway fits into its urban environment will add design and construction challenges. The intent is to have a more functional and attractive urban corridor once complete. What are the possible benefits of the project? The Project Team is currently conducting an Environmental Impact Statement to analyze and disclose the impacts and benefits of each alternative under consideration. How many vehicles travel on I-84 in Hartford? I-84 through Hartford is the busiest section of highway in Connecticut. It was built in the 1960s to carry 50,000 vehicles per day. Now, as many as 175,000 vehicles travel this stretch of highway per day, more than three times its original anticipated volume. The high volume, along with outdated design features, contribute to high crash rates and congestion on both I-84 and city streets, especially during the rush hour commutes. How many crashes are there on this stretch of I-84 each year? From 2009 to 2011, there were 1,932 motor vehicle crashes on this section of roadway. Closely spaced interchanges, left-hand entrance and exit ramps, short merge sections, narrow shoulders, and sharp curves all contribute to the poor operations and the high crash rate. Why was I-84 built with outdated design features? The design of I-84 was not outdated in the 1950s, and the planned-for traffic volumes were much lower. The standards for roadway and interchange design have evolved over time. Safety and construction standards have also evolved. I-84 will be redesigned to meet today’s design standards. Why was I-84 built with so many bridges? This section of I-84 was built mostly on bridges to avoid the railroad, which I-84 crosses over in two locations. Are the bridges safe to drive on? Connecticut’s bridges are evaluated once every two years. Each bridge receives a grade from 0 to 9 based on many factors. A grade of 0 means the bridge can no longer carry traffic. A rating of 9 is a newly built bridge in excellent condition. Many of the bridges in the I-84 Hartford Project study area have grades in the 4-5 range, which CTDOT describes as “fair to poor.” This means that the bridges are safe to drive on, but in need of major repairs or rehabilitation soon. Regular repairs will continue, but are not a long-term solution. Is there a city like Hartford that has successfully rebuilt an aging highway? Many other cities - Milwaukee, San Francisco, Boston, Syracuse, and Providence - have either studied or are studying similar aging urban highways. Each situation is unique in terms of traffic volumes, travel needs, and corridor features. While we can learn from those cities, I-84 will require its own tailored solutions. Will the I-84 Hartford Project affect traffic and travel patterns? If you live, work or travel in central Connecticut, it’s likely that this project will affect your travel to some degree. Once construction is complete, traffic on I-84 will move more efficiently. Not only will the viaduct be enhanced, travel on many local streets connecting to I-84 will be improved, too. However, no single project will reduce road congestion entirely. Travel patterns will be improved for pedestrians, bicyclists, and transit riders too. We anticipate that the urban environment near I-84 will be more pleasant and useable for all due to streetscape improvements and increased emphasis on transit-oriented development. During construction, traffic conditions will be impacted over an extended period, which will affect many travelers. Travel management during construction will be thoroughly planned and communicated before construction begins. What are the basic project steps? The Project Team is currently conducting Steps 3 and 4. How long will it take to replace I-84? A decision about what to build is anticipated by 2020. Construction could begin in the early 2020s, and will last several years. Many factors may affect this schedule. For example, how long construction takes will depend on the alternative and the construction method chosen. As the project progresses, the timeline will become more clear. Why will it take so long to complete this project? Replacing I-84 through Hartford is very complex. Approximately two miles of I-84 and several interchanges will be demolished and reconstructed with a totally new design. The highway may continue to carry up to 175,000 vehicles per day. At the same time, numerous local streets will be reconstructed or newly constructed. Two of the design alternatives would require the railroad to be relocated and a new passenger station constructed. Many difficult design and construction issues must be resolved. All federal and state requirements must be met before the project breaks ground. The Project Team is taking many opportunities to listen to those who will be affected by the project. As planning and design evolves, it’s our role to help the community understand project benefits and impacts. It’s essential to finding the best solution and achieving long-term success. Will my voice really affect the project? Many voices have helped shape the project to date. Community involvement is a fundamental part of this project. The Connecticut Department of Transportation believes that the more people who understand the project and share their ideas and concerns, the more successful the project will be. Public participation helps ensure that the Project Team fully understands and addresses public concerns. There are many ways to get involved. Please share your ideas! To get involved, you can attend one of the project’s frequent meetings, join the contact list, follow us on Facebook, Twitter or Instagram, and read project materials on the website. If you have questions, please ask them on the website or on social media (or even contact us by phone at 860.594.3191). How does CTDOT decide which alternatives to evaluate? Many sources of information, including input from stakeholders, helps shape the alternatives. The I-84 Hartford Project follows a process outlined by the National Environmental Policy Act (NEPA). During the scoping process, the Project Team openly solicited the community’s and agencies’ input on all issues and concerns to be addressed as part of NEPA. NEPA requires that all reasonable transportation alternatives are considered, that community input plays a key role, and that project impacts are fully assessed and shared with the public. Every alternative that advances into the environmental impact process must meet the project Purpose and Need. How do alternatives get evaluated? Alternatives start out as broad concepts. They then get refined and modified, based on feasibility and how well they meet the project Purpose and Need and other goals identified early in the planning process. As the alternatives become more refined and detailed, those that best meet the criteria will advance into the Environmental Impact Statement for more detailed assessment. At the end of the environmental process, a Record of Decision will be made, selecting which alternative to build. What alternatives are being considered? 1. No Build Alternative, keeps the existing I-84 configuration. This alternative involves a lot of construction, as it includes replacing many bridges on the existing alignment, as needed. 2. Elevated Alternative, replaces existing I-84 with a new, modified highway, which is mostly elevated above ground level. 3. Lowered Highway Alternative, relocates the existing railroad and replaces the existing I-84 with a new, modified highway at a lower elevation-either at ground level or below ground level in a cut section. 4. Tunnel Alternative, relocates the existing railroad and replaces the existing I-84 by putting much of the highway in the study area into a tunnel section. Each build alternative has numerous sub-options with different ramp configurations and design features. The development, evaluation, and refinement of these options is an ongoing process. How many alternatives will be studied? With the three build alternatives and their various ramp options, the Project Team has considered over 150 possible design scenarios to date! The team is committed to considering all reasonable options which meet the project Purpose and Need and the project goals. Who decides which alternative is chosen? Ultimately, CTDOT and the Federal Highway Administration (FHWA) will decide which alternative best meets the evaluation criteria. The decision will be based on many factors including stakeholder input. The decision will be documented in the Record of Decision which is the final stage of the environmental impact analysis process. How will a reconstructed I-84 reduce the highway’s impact on the city? How much land might be freed up for other uses? It varies, but some of the alternatives can free up as much as 40 acres of land! Every alternative would decrease the footprint of the highway and ramps, and some designs include decking over parts of the highway to allow for development or other uses. Will the I-84 Hartford Project affect the rail corridor? The potential impact to the rail corridor varies per alternative selected. Some alternatives, including the Tunnel Highway Alternative and the Lowered Highway Alternative, involve relocating the rail to the northwest near the Asylum Hill neighborhood. This would require constructing a new station and parking facility for rail travelers. The timing could be ideal, as the Union Station rail viaduct is also in need of replacement. CTDOT recently completed a Hartford Rail Alternatives Analysis to evaluate ways to address the replacement of the aging rail viaduct. The preliminary conclusion was that moving the railroad to the northwest would best serve the railroad. Coordination with Amtrak and the City of Hartford are ongoing on this topic. Will the I-84 Hartford Project affect rail service? Amtrak service, freight, and the new Hartford Line service (beginning in 2018) will be minimally affected during the reconstruction of I-84. Will the I-84 Hartford Project affect CTfastrak? Depending on the alternative selected, a segment of CTfastrak in Hartford east of Sigourney Street may need to be adjusted. The goal will be to maintain CTfastrak service at full (or increased) capacity during construction. Will Union Station be affected? Depending on the alternative selected, if the railroad is relocated, it would affect the location of the rail passenger terminal. While the historic Union Station building will not be relocated, it may be re-purposed for transportation and/or other uses. A new passenger terminal would be constructed in a nearby location to better connect rail and transit with other modes of travel, and to provide opportunities for transit-oriented development. What is the Park River Conduit? The Park River, which once flowed through Bushnell Park, was prone to floods and unsanitary conditions. To prevent these costly, dangerous, and unhealthy floods, the Park River was put into a very large underground pipe (conduit) beginning in 1943. It still flows underground and is a factor in the development of alternatives, as some of the alternatives would require moving a portion of the conduit. Relocating the conduit may not be possible because of cost and regulations. Is the state considering a ring road to bypass Hartford? CTDOT must rebuild I-84 in Hartford because of the poor condition of the bridges and other transportation issues. A ring road does not meet this project’s Purpose and Need. Furthermore, most peak traffic on I-84 in the study area begins or ends somewhere in Hartford. A ring road would not benefit those travelers. A beltway (I-291) was last considered in the 1970s, and was vigorously opposed by the public for environmental reasons. It is likely that strong opposition would still exist for this option. Many have recognized that the I-84/I-91 interchange contributes to congestion. CTDOT has initiated a feasibility study to assess expanding the capacity of this interchange or relocating it to the north or south. Accelerated construction means reducing the time needed to construct a project. One method is to use prefabricated structures, where pieces of roadway are built outside the project area, allowing the highway to remain open while they are being built. Not only can this reduce construction time, it can also minimize impacts to travelers and surrounding neighborhoods. An extreme method involves closing some or all of the highway during construction. Although closing I-84 is an unlikely scenario, this has been done successfully in other cities. Road closures are becoming increasingly popular in communities around the country because they can greatly shorten construction time. This is also the safest construction method as it virtually eliminates accidents between drivers and construction workers or equipment. What does environmental documentation or environmental review mean? Every project that proposes to use federal or state funding must comply with the National Environmental Policy Act (NEPA) and/or Connecticut Environmental Policy Act (CEPA). NEPA and CEPA require impacts to be reviewed and documented before decisions are made on a course of action. In the case of the I-84 Hartford Project, the environmental review and documentation will be in the form of an Environmental Impact Statement. During project design, there will also be many environmental permits required from various agencies. In 1969, the U.S. Congress passed the National Environmental Policy Act (NEPA), which promotes more informed decision-making of federally funded projects. NEPA requires an environmental document to evaluate the environmental effects of federally funded projects. In the case of the I-84 Hartford Project, NEPA requires that alternatives be evaluated. Similar to the National Environmental Policy Act (NEPA), the Connecticut legislature passed the Connecticut Environmental Policy Act (CEPA) in 1971 for projects using state funding. Many other states have similar legislation. If a project involves both federal and state funding, it must comply with both NEPA and CEPA. What is a Purpose and Need Statement? The Purpose and Need Statement explains why a project is necessary. It defines the transportation problem to be solved and outlines other goals and objectives. The Purpose and Need Statement also defines the expected results of the project and guides the development and evaluation of alternatives. By providing input during the scoping phase, regulatory agencies and the public help develop the scope of the environmental document so that the process is thorough, comprehensive and focuses on concerns. At the end of the scoping period, all comments will be summarized and responded to in a Scoping Summary Report. The material in the Scoping Summary Report helps guide the development of project alternatives. What types of impacts does an Environmental Impact Statement consider? The Environmental Impact Statement (EIS) considers the full range of potential impacts to the natural and built environment. The natural environment includes resources such as wetlands, surface and groundwater resources, endangered and threatened species, geology, topography, soils, farmlands, contaminated sites, energy consumption, air quality, noise and vibration and others. The built environment includes resources such as land use and neighborhoods, buildings, historic structures and districts, archaeological resources, parks and recreational areas, community resources, relocation of impacted buildings, utility impacts, and visual and aesthetic impacts. The EIS will also examine the cumulative, secondary and growth-inducing impacts that the proposed action can have on the community, as well as short-term impacts related to construction activities. Where significant impacts may occur, the EIS will propose mitigation to compensate accordingly. Mitigation means making up for unavoidable impacts that result from the project. For example, after the CTfastrak busway was built, new wetlands were created along Flatbush Avenue in Hartford to mitigate for wetlands lost for busway construction. If property is taken to complete a project, the property owner must be paid to compensate for the taking. If an important historic resource is impacted or taken, that resource must be documented so that its memory is not lost. Many other types of mitigation are regularly carried out. What buildings will be impacted by this project? The number of buildings affected differs substantially with each alternative, although all build alternatives would cause some building impacts. Building impacts associated with the Elevated Alternative are less than those associated with the Lowered and Tunnel Alternatives, because the Elevated Alternative does not involve the relocation of the railroad. Building impacts range anywhere from nine buildings for the Elevated Alternative, up to 19 buildings for the Lowered Alternative and up to 22 buildings for the Tunnel Alternative. As any alternative is further developed, all measures will be taken to reduce the number of building impacts. What will the Project Team do to keep the people who are displaced (via building purchases) in Hartford? To make I-84 safer and more efficient for all users, CTDOT may have to purchase some buildings. Although the owners of all taken property will be compensated for their real losses, the Project Team understands that many residents and business owners in potentially impacted buildings rent or lease their homes or business space. Tenants may be eligible to receive relocation assistance from CTDOT, and the Project Team hopes they will remain in Hartford with minimal disruption to their lives. When completed, the project itself may free up tens of acres of land for open space or new development, including residential or commercial property. CTDOT may utilize some of this land for other transportation facilities or infrastructure, but a significant amount will likely be made available for private or public development independent of CTDOT or the Project Team. 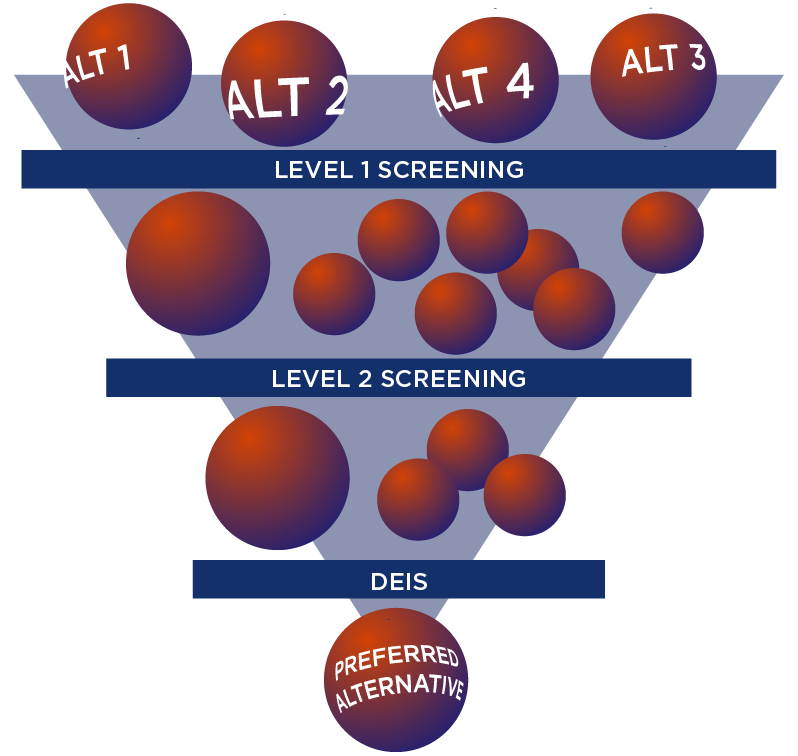 What is a preferred alternative? This is the alternative, after analysis and comments, that CTDOT believes best satisfies the overall public interest based upon a balanced consideration of a broad range of issues. Designation of a preferred alternative is not a final decision, but is an indication that one alternative seems to be the best solution. Additional effort is put into assessing the impacts of that alternative. What is a Record of Decision? The Record of Decision (ROD) is issued by the Federal Highway Administration (FHWA). It is made following consideration of all comments and the completion of the Final Environmental Impact Statement. The ROD provides the final decision on which alternative will be constructed and includes the basis for the decision. After the ROD, CTDOT may proceed with final design, property acquisition, and construction based on the availability of funds. How much will it cost to reconstruct I-84 through Hartford? These estimates include the planning, design, property acquisition and construction costs of each alternative. They do not include the maintenance of the structure once it is built. They will continue to be refined in the coming years as design details are better known. Project funding is currently available for planning, conceptual design, and environmental review. Once the ROD is issued, funding for final design, property acquisition, and construction will be sought and programmed. How will the State pay for improvements to I-84 in Hartford? It has not yet been determined how improvements to I-84 will be paid for. The State of Connecticut is responsible for maintaining its interstate highways with some assistance from the Federal Highway Administration (FHWA). The federal government usually pays about 80-90% of reconstruction costs, and the state pays the other 10-20%. However, it is unlikely that there will be sufficient federal funding available to complete the project. Many states, including Connecticut, are exploring new ways to pay for these large projects. Why do we need a new station? The Lowered Highway Alternative requires relocating the railroad northwest of the highway to allow rebuilding I-84 at ground level. This means that the railroad tracks will no longer lead to Union Station. A new station will be built roughly 1,000 feet west of Union Station at the new track location. While the historic Union Station building will not be relocated to the new track location, it may be re-purposed for other uses. Planning for its reuse is a critical element this effort. Why are all the station concepts in Asylum Hill? The location of a multimodal station within or near downtown Hartford is important to serve both residents, commuters and businesses, and to spur transit oriented development (TOD) in the central business district. Today’s stakeholders, as well as those involved dating as far back as the Hub of Hartford Study, agree that the best location for the multi-modal station to spur economic development is near the intersection of Asylum Avenue, Farmington Avenue, Broad Street and Cogswell Street. In addition, from an operational perspective, the level of service to be provided by both Amtrak intercity trains and CTrail trains requires boarding platforms to be at least 1,000 feet long and built on a straight alignment. The section of relocated railroad that will run beneath Asylum Avenue in Asylum Hill is the closest section of track in or near the downtown that meets these requirements. What does “multi-modal” mean? What kind of transportation will use the new station? Multi-modal in this context is a word used to describe two or more types of transportation. One objective of the multi-modal station planning process is to make the station accessible to transit riders, bicyclists, pedestrians, and drivers. Plans for the multi-modal station include ADA-accessible facilities for Amtrak and CTrail, CTtransit, CTfastrak, inter-city buses, bicycle and vehicle parking, taxis and/or car/ride-share. The word “overbuild” is used to describe the station facilities or buildings built over the lowered highway or lowered railroad tracks. In other areas of this website, we refer to a “cap” that would cover the highway between Asylum Avenue and Broad Street. A station on overbuild would be a station located on top of this cap. It is important to consider the difference between overbuild stations and stations built on solid ground. For example, overbuild stations would likely be more expensive to construct, may take longer to build and include different safety considerations than stations built on solid ground. On the other hand, overbuild stations avoid using space on solid ground that could be valuable for future private development or open space. What does “phased construction” mean? “Phased construction” in this context means building different pieces of the project at different times. The Project will be built using phased construction to relocate the railroad and CTfastrak and rebuild the highway. Constructing in phases allows for continuous operation of the railroad, highway, and CTfastrak, as well as access from highway to the city. Travel will be disrupted to some degree by the phasing but less so than if by closing the highway entirely. How will CTfastrak serve the new station? Today, CTfastrak serves Union Station via a nearby stop on Asylum Street. Depending on the station concept and CTfastrak alignment selected, CTfastrak may serve the station directly, or include a stop on a nearby street like it does today. More updates on CTfastrak will be provided as they become available. Will more buildings need to be torn down to build the station? No buildings will be torn down to build the station. The Lowered Highway Alternative requires relocating the rail to the west, and this relocation would require some buildings to be purchased and torn down. Although the station may be built on land on or near some of these buildings, none of them will be torn down just to build the station. Asylum Avenue carries a lot of traffic. How will a new station near Asylum handle all the station users? Station access is an important consideration. Today, Asylum Street and Avenue carry considerable traffic directly off of I-84 highway ramps. Although traffic volumes would still be high, the Lowered Highway Alternative would not only move the on- and off-ramps off of Asylum, but also build a number of new roads to better distribute traffic. No station concepts put station driveways on Asylum Street. Who has a say in the multi-modal station planning process? The Project Team is asking anybody who has an interest or a stake in the multi-modal station to make their voice heard. You can share your thoughts on the Contact Us page of this website. Additionally, several stakeholder groups are assisting in the planning process. These include the I-84 Hartford Project Public Advisory Committee, a Transit Technical Committee made up of the owners and operators of various transit providers, and those who attended two Open Planning Studios and two Multi-Modal Station Working Sessions in 2017. The Open Planning Studios occurred in April 2017 and the Multi-Modal Station Working Sessions occurred in August and October of 2017. Both groups may reconvene in the future. The materials and reports of these sessions are available in the Library section of this website. Will the I-84 Hartford Project address issues with the I-84/I-91 interchange? The I-84 Hartford Project, as currently defined, stops just west of the existing downtown tunnel and the I-84/I-91 interchange. However, a new study has been authorized by CTDOT to look at possible solutions to the heavy congestion through that interchange. What is the I-84/I-91 Interchange Study? A new conceptual planning study is underway to investigate options for the I-84/I-91 interchange. In this study, the Project Team will evaluate options to either reconstruct the interchange in its current location or replace it with a new interchange north or south of its current location. Why is the I-84/I-91 Interchange so congested? I-84 carries three lanes in each direction both east and west of the I-84/I-91 interchange. The road narrows to carry only two lanes in each direction on the bridge across the Connecticut River, causing congestion and delay, especially during peak rush hour. What kinds of jobs do large highway and bridge construction projects create? Other jobs include those administrative positions and indirect jobs that support the highway and bridge workforce. What should contractors know about large highway and bridge construction projects? Many of these projects will get at least some of their funding from the federal government. Federal regulations require that States and their contractors meet numerous criteria to obtain both formula and/or discretionary funding for federally funded projects. Federal aid highway and bridge projects often require that a portion of any contract be awarded to a Disadvantaged Business Enterprise (DBE) company. In addition, a small number of projects may have project labor agreements, which require construction companies to enter into agreements with local unions to set hiring, working, and payment conditions for the entire contract. What is a Disadvantaged Business Enterprise (DBE)? A Small Business Enterprise (SBE)? A Disadvantaged Business Enterprise (DBE) is a business that meets the United States Department of Transportation’s DBE eligibility requirements and is certified by the CTDOT as a DBE business. Learn more about the DBE eligibility requirements. Contact the CTDOT’s Office of Contract Compliance for more information on acquiring DBE certification. A Small Business Enterprise (SBE) is a business that meets the Connecticut Department of Administrative Services (DAS) SBE program eligibility requirements and is certified by DAS as an SBE/MBE business. Learn more about the SBE eligibility requirements. Will the I-84 Hartford Project be a union or non-union project? The size of the I-84 Hartford Project is unprecedented in the State of Connecticut. It is likely that more than one contract would be awarded to build the project, and these different contracts would be for different segments of the project. As a result, multiple contractors might be involved in the potential construction of I-84 in Hartford. The use of union or non-union labor will be determined primarily by the status of the contractor(s); the contractor(s) that win the bid (and get the contract) may be a union or non-union contractor(s). Is a career in construction right for me? Only you can answer that question! Although the construction industry includes many careers drawing on a variety of skills, rebuilding Connecticut’s highways and bridges, as well as other vital infrastructure around the country, will be no easy job. Experts expect a national shortage of skilled and prepared workers capable of rebuilding our country’s transportation infrastructure. Now may be a very good time to consider a career in construction. What can I do to prepare for a career in construction? The CTDOT builds many highway and bridge construction projects every year. Those interested in careers in construction should start preparing now. Mastering soft skills, such as handshakes, eye contact, interviewing, résumé writing, and presentation, are important for career success. Community organizations may be able to assist you with building soft skills. Complete high school - Obtain a high school diploma or graduate equivalency diploma (GED). Focus on math as many trades require proficiency in algebra, geometry, trigonometry, and calculus. Consider attending technical high schools and other schools with courses in specific trades. They offer the opportunity to develop skills while also working towards a diploma or certification. Contact trade unions or organizations to learn about apprenticeship and training opportunities - All trade unions require their apprentices to have a high school diploma or GED. In several fields, you can start training right out of high school through paid apprenticeship programs. Become licensed and/or certified (if required) - Different trades require specific training and experience, and some require a state license to practice (for example, electricians and crane operators). Who can I go to for a job? The Connecticut Department of Transportation does not hire construction workers directly. Construction contracts are competitively bid, and are awarded to the lowest responsible bidder. If you are looking for a construction job, a good place to start is with local contractors or the trades unions. Can I work on the project if I have been convicted of a crime? CTDOT adheres to all state and federal laws that prohibit discrimination in hiring. Every contracting company hired by CTDOT legally commits to the state that it has a policy and practice of non-discrimination in its hiring decisions, as required under the law. Challenges to getting employment may exist, however, for those with criminal histories. CT laws regarding hiring and prior offenses may be viewed at CGS Public Act No. 16-83, Bill No. 5237 - Jan 1 2017.